The Hand-forged Knife Blade is a great piece of kit to have if you’re one to get hands-on with your bushcraft gear. 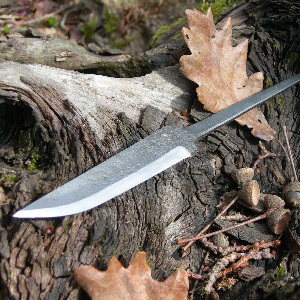 Made using traditional forging techniques by esteemed Swedish blacksmith Julius Pettersson (as seen in the ‘Sweden’ episode of Bushcraft Survival Series 2), each carbon steel blade comes ready to be fitted with your own handle, allowing you to be creative and finish off your very own custom tool. 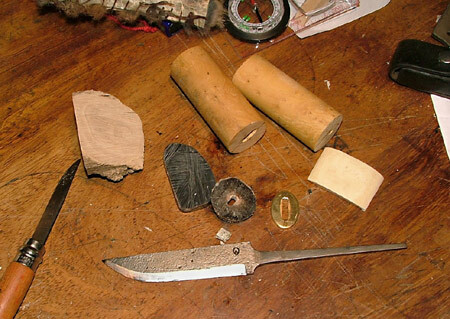 To make his knife handle, Max used the following materials (from left to right on the below picture): brass hilt from scrap, red deer antler, leather, ivory, leather, box wood, leather, box wood, buffalo horn. If you’ve had a go at making your own handle for one of these blades, please send us a photo; we’d love to see all the different variations on design and the materials that you’ve used, and you may find yourself on the receiving end of a £10.00 Woodlore Voucher if your picture ends up on our blog. This entry was posted in Bushcraft Clothing & Equipment on September 20, 2010 by Woodlore Team. Alfie – it is indeed ivory, but I can confirm it was a very old bangle that I inherited and allowed Max to cut up for his knife. I was pleased that it was able to be put to good use. It’s looking great. Very nice handle. Ivory? If it’s antique you might as well use it. But would be good just to clarify. Nice work! I’m sure you will enjoy that quality knife. Self made gear is the best there is! You know what went into it, what you can expect from it, and maybe even what it takes to fix it. I love my own Mora #2 that I put a custom handle and sheath on. Can’t imagine another knife that could replace it.